Whether your house catches fire or a break in occurs while you’re home, you should have a premeditated evacuation plan in place. Meet with your family tonight and determine a designated meeting spot, such as a neighbor’s house down the street, if you haven’t done so already. If you have children, be sure to assign an older person (sibling or otherwise) to be in charge of getting them all out of the house and to the designated meeting spot safely. Evaluate each occupied room in your home to determine how easy it is to get outside. 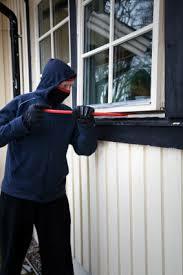 If you have the misfortune of a burglary occurring while you’re home, remain calm and don’t make any noise. This will only draw attention to yourself and others in your home, potentially bringing harm unto you where you want to avoid it most. Go to the nearest room with a door and close it gently and lock it if you can, all quietly. Try to listen for clues, which will help you in the next step. Do this immediately. Your cellphone should always be fully charged and on your person. When you call, quietly, but clearly, tell the operator your name and address and that there is an intruder inside your home. After having listened, gaining information about the number of intruders, male or female, etc., report this to the operator. Also, if you can tell just by listening, tell the operator which room and what floor the burglar is currently in. The operator will provide you with helpful advice to keep you and everyone else safe, so stay on the line. Also, the sooner you call, the sooner help will arrive, so make it a priority to call immediately. The 911 operator may ask if you can get out of the house safely. If you can, after having listened to and determined the burglar’s location, this is the time to make your move. Go directly to the aforementioned designated meetup spot. On the other hand, if you can’t make a safe escape, stay in the locked room and remain on the line with the operator until the police arrive to handle the situation. Confirm with the operator that police are on the property and when they clear the house, deeming it safe for reentry. At Instant Alarm, the safety of you and your family is our top priority. We hope that a break in never occurs to anyone, but if it does, we want you to take the proper steps to ensure everyone is safe. If you’d like to look into installing an alarm system, contact us by phone at 800-499-9070, or visit our website at https://instantalarm.com/.